PSC Notes (pscnotes.com) is a leading website providing valuable, convenient, relevant and enjoyable online education pertaining to General Studies, State GK & Current Affairs to students, aspirants and general public through a diversity of services. 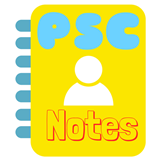 This website is a venture of pscnotes.com, a sole proprietorship . Our Corporate office is located at 3, Kapil Vihar Banna Devi Aligarh.